In einem Todt. . . [ Chateau Chenonceaux ] - MEISNER, D.
Title : In einem Todt. . . [ Chateau Chenonceaux ]. 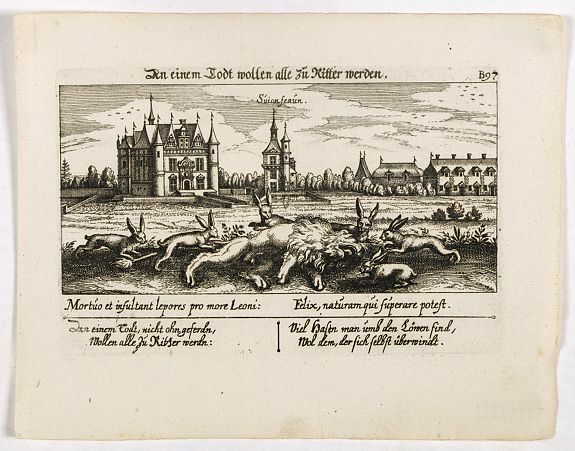 Description :A very nice depiction of Chateau Chenonceaux near Tours, France with in the foreground of a dead lion, surrounded by rabbits. With a verse in two languages underneath the picture. Condition : Copper engraving. A good and dark impression. Very good.